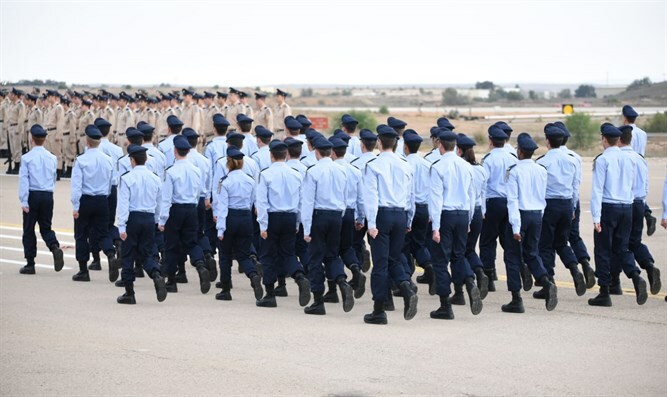 Prime Minister Binyamin Netanyahu spoke this afternoon, Wednesday, at Hatzerim Air Force Base during the IAF pilots' course graduation ceremony. "Several days ago I visited Israel Aerospace Industries. They are developing special capabilities that no other country in the Middle East has, and I tell you that some of them, no other country in the world has," Netanyahu said. "This includes weapons systems, defensive systems and offensive missiles that can reach any target anywhere. In the history of the Middle East, there has never been aerial activity such as this. Aircraft ascend and descend, take off and land, and reach arenas both near and far, very far." "Course graduates, you have one mission: Defend the homeland and be victorious in war. Defending the homeland starts with eradicating major hostile threats. We are not prepared to accept the Iranian military entrenchment in Syria which is directed against us. We will act against it vigorously and continuously including during the current period. "I have said that we will not be deterred from doing what is necessary. Therefore, we are called upon and we act. President Trump's decision to withdraw the American soldiers from Syria will not change our policy. We are standing steadfast on our red lines in Syria and everywhere else. "As part of foiling the threats, we are continuing with Operation Northern Shield on our border with Lebanon. Yesterday I toured the line with the IDF Chief-of-Staff, GOC Northern Command and the members of the Security Cabinet. I saw the excellent work that is being done there. We are eliminating Hezbollah's terrorist tunnels one after the other. They think they can produce weapons of destruction against us and we can overcome them with stratagems, daring and determination."